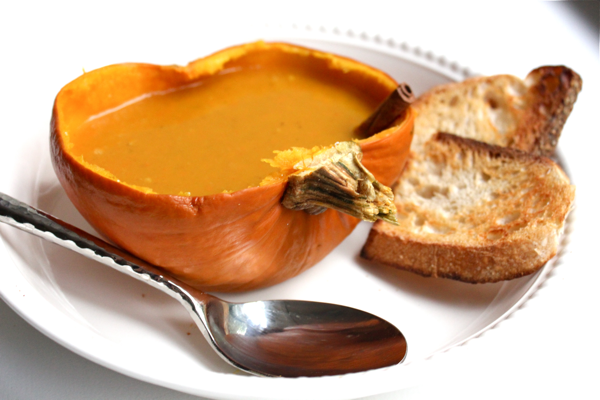 I have been trying to make a pumpkin soup like the one from Au Bon Pain for quite a while. Last winter, I shared one of my failures with you, and you were so kind to share many recipe ideas. After tasting ABP’s pumpkin soup a few more times and referencing its ingredient list, I have finally come up with a great imitation recipe. It’s a touchdown (my spoon touches down to an empty bowl)! A hole in one (from spoon to mouth)! A home run (I have to run home to eat more of this soup)! This recipe makes about 10 servings of soup. 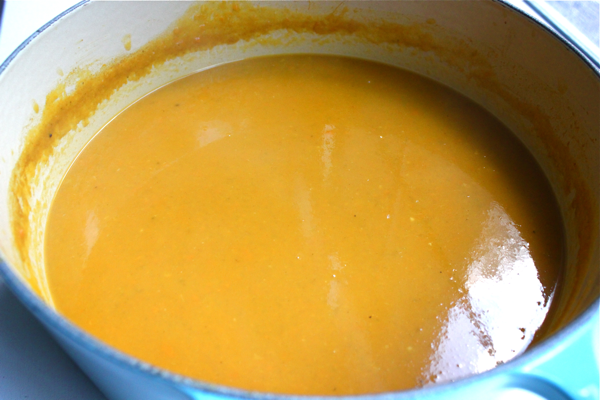 One of the tricks to making the perfect pumpkin soup is to start off with a roux. 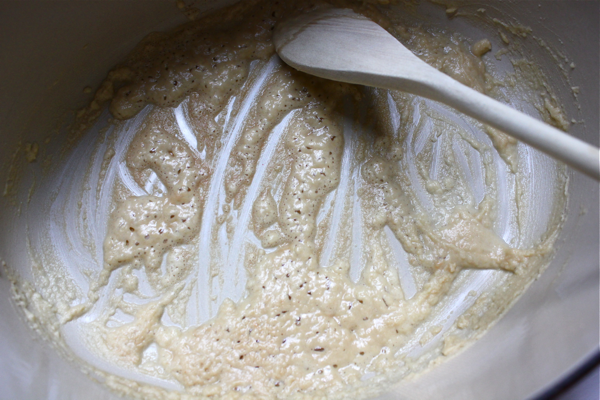 Melt 2 tablespoons of butter in a large pot and whisk in 2.5 tablespoons of flour. Whisk constantly until the roux browns, and then whisk in 2 quarts of vegetable stock. Apparently, a roux + veggie stock = a velouté. I have always liked veloutés, but I never knew how they were made. 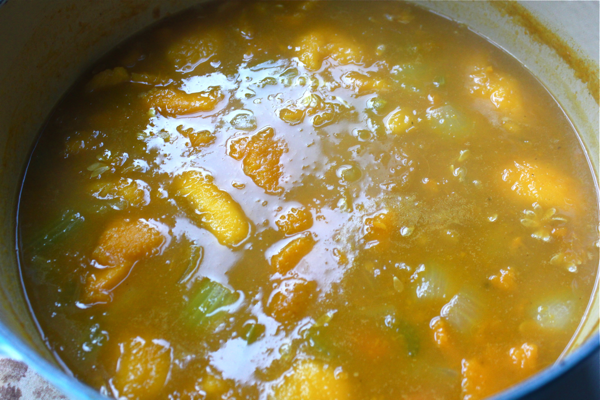 While the stock comes to a simmer, steam 1 pumpkin and 1 buttercup (not butternut) or kabocha squash. I steam my squash by microwaving it with a little bit of water in a covered, microwave-safe bowl for 8-10 minutes depending on the thickness of the squash. Canned pumpkin/squash purée would also work. Roughly chop 2 large carrots, 3 celery stalks, 1 onion, and 2 cloves of garlic. Add the chopped veggies (not the pumpkin or squash) into the pot. 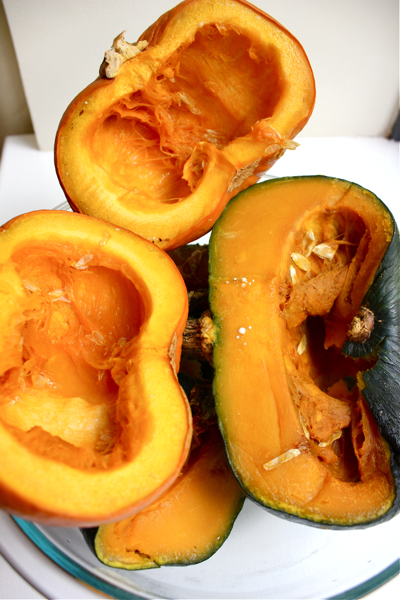 Once they are softened, add in 2 cups of the steamed buttercup/kabocha squash and 1 cup of the steamed pumpkin. Let them simmer until they are completely softened. Stir in 1/8 cup of brown sugar, 1/2 teaspoon of tomato paste, 1 tablespoon of cinnamon, 1/4 teaspoon of nutmeg, a pinch of black pepper, and grate in a 1-inch piece of fresh ginger. Blend the soup with an immersion blender or with a traditional blender until it is smooth. Season the soup with salt to taste. When serving, you can send this soup over the top by crumbling in some pieces of crispy bacon…oh la la! I hope this hearty and comforting soup keeps you toasty and warm in the falling temperatures. Your recipe sounds easy and tasty. How can one sister like pumpkin so much and the other not like it at all?! My heart if she doesn’t.